Yorkshire Sculpture Park, October, 2018. 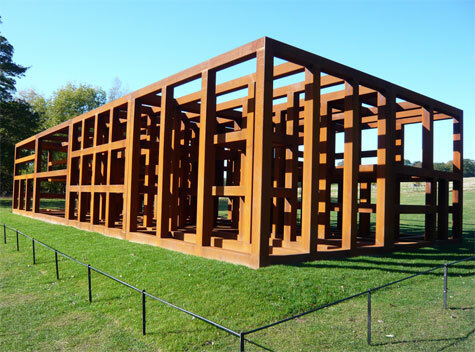 The weather forecast was for a freakishly warm day with unbroken sunshine and judging by the business of the Yorkshire Sculpture Park car park that Wednesday morning, many of the visitors believed they were in for a cracking day. Mitch had arranged to meet his friend Bill outside the gift shop entrance with the suggestion of spending a leisurely day walking around the splendid grounds of the park. Mitch arrived first. He decided to wait just outside the entrance to the main building so that he could enjoy the sunshine. He sat on a bench opposite the car park and kept an eye out for Bill. He wasn’t too concerned about keeping a constant look out because he was sure if he didn’t see Bill, Bill would spot him. Mitch was not easily missed. He was a large man: six feet four inches tall and weighing nearly sixteen stones. He was dressed in a horizontally striped, blue and white rugby shirt, salmon pink trousers and light brown deck shoes. His thick grey hair sprouted like unruly cauliflower on his head. A pair of tiny but expensive binoculars hung around his neck. Within a couple of minutes he heard his name being called – Bill had arrived. Mitch turned and saw a man walking towards him who was wearing thick-framed, dark glasses and a black Stetson hat. His most distinctive feature was his handlebar moustache: it grew so thickly on his upper lip that it seemed to flow out of his nostrils in a flood of bristles and could easily be mistaken for a fake one that he’d clipped to his nose. Mitch assumed that the moustache was carefully dyed every month because a sixty-year old man sporting such uniformly black facial hair seemed unlikely. In their long friendship he’d never thought to ask him if he did dye it. Bill’s black headgear was matched with a beautifully tailored black shirt, a black leather waistcoat, black jeans and black boots. A blood-red neckerchief set off the whole ensemble. All that he was missing to be the archetypal bad guy from a Western movie was a six-shooter hanging from his hip. There was a firm handshake between the men; arthritis hadn’t attacked either of their hands yet. Mitch said, ‘I suggest we go anti-clockwise today, just for the hell of it.’ Bill shrugged his shoulders in a carefree manner and they commenced their walk around the park. 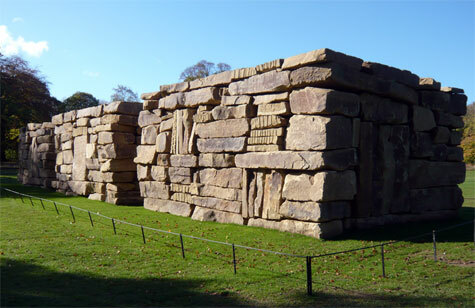 The first new piece of sculpture they encountered consisted of three piles of sandstone blocks, stacked in such a way as to form rectangular structures. The massive structures towered above them as the two men strolled around the artworks. Each block of stone varied from the size of a washing machine to a double bed. The stone was not worked in any way other than being cut roughly into rectangles by big machines and drills. The one response it did evoke in the men was a childish urge to climb the structures using the easy handholds and footholds offered by the gaps between the blocks but a prominent sign instructed visitors to resist such a temptation and just in case they couldn’t read, a thin rope around the sculptures created a border of forbidden territory. ‘Is this art?’ asked Mitch. ‘So the wall can’t be art then. Isn’t it playing on the standing stones idea from ancient times? Shall we read the notes?’ Bill looked around for the plaque or sign that would probably explain the inspiration for the piece. Or not. When they reached the Long Gallery there was another installation they hadn’t seen before erected on the grass bank by the corner of the building. It consisted of sheets of metal stacked on top of each other as you might find in any steel fabrication warehouse that was run by a foreman with bad OCD. ‘Oh dear,’ said Mitch. This time Bill didn’t ask what the problem was, he already knew. They had a look around the Long Gallery but Bill felt the need to hustle Mitch out of it as soon as possible as the artworks were having a deleterious effect on his mental health. They walked up onto the ridge of the hill known as Oxley Bank that commanded a splendid view of the old Bretton Hall and the surrounding countryside. From one angle they could make out the M1 in the distance with ant-like vehicles crawling backwards and forwards along a black line in the landscape. Both men sat on the bench that had been positioned to take advantage of the vista and looked on in silence. Bill took off his Stetson, untied the red neckerchief from around his neck and wiped his sweating forehead with it. The climb and his black clothes in the burning sunshine had made him sweat profusely and his clothes felt uncomfortably clammy. Mitch peered through his binoculars at the horizon at nothing in particular; he just liked the power of being able to see into the distance. ‘Do you want to take a look?’ he asked Bill. As they made their way through the trees along the ridge, Bill said, ‘Hang on, I want to have a look at the Goldsworthy piece,’ and he walked down a short little path that led to the boundary wall adjacent to a field. Jutting out from the wall was an enclosure built in the same style as the wall. When Mitch joined him and they looked over the enclosure wall they could see a deep pit about ten feet in depth and suspended in the void was a tree trunk lying horizontally. 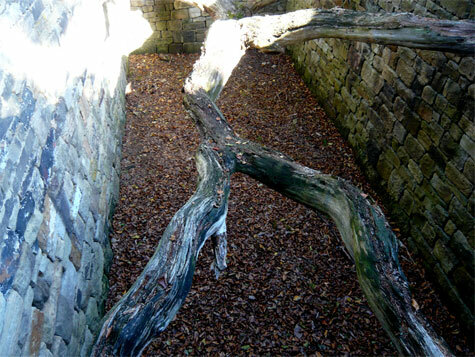 It was held up from the ground by being built into the surrounding stonework as if it were growing through the walls in an unnatural manner. The piece was old now and the tree trunk was starting to rot heavily which detracted from its weird configuration. ‘I sometimes think that about life,’ said Mitch. They came to the end of the ridge and started the slow descent that led down towards the lake. A familiar artwork greeted them in the trees: Speed Breakers by Hemali Bhuta. 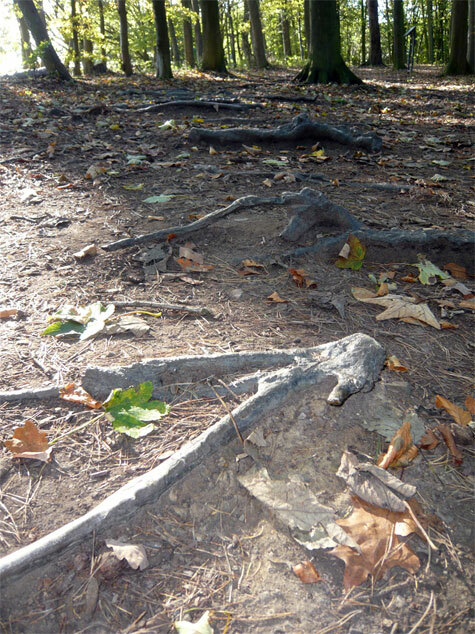 Both men stared at the bronze tree roots poking out of the ground. A hundred yards further along Mitch became animated and his voice boomed through the trees. 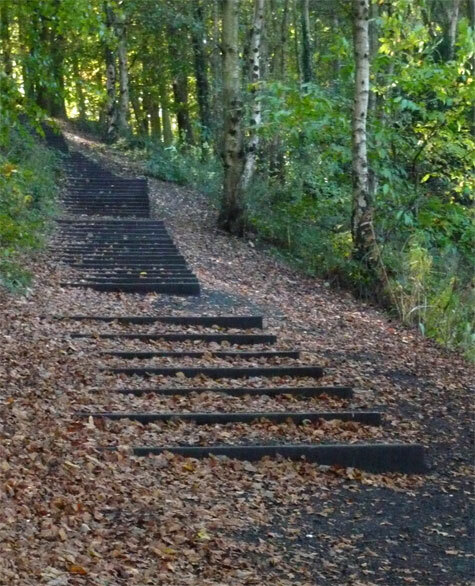 They’d come across ‘Seventy-one Steps by David Nash: an artwork that did exactly what it said on the tin. ‘Use mine,’ and Bill produced his smart phone from his jean pocket. Mitch hissed and made the sign of the cross with his two index fingers. ‘Keep your devil works away from me. I only interact with dumb phones. Serves me right for not remembering my notebook. What sort of writer forgets to carry a notebook at all times? I’m going to trust my memory, I’m not senile yet,’ and he gave up looking for any writing materials. ‘Good thinking, Bill, it will help me remember the idea later by talking about it now. As they crossed over the bridge above the weir at the end of the lake, Mitch was vocally exploring the ramifications of his thoughts in a stream of consciousness – he was enjoying himself. On the climb back up the open grassy hill to the main building they came across another new piece of sculpture. 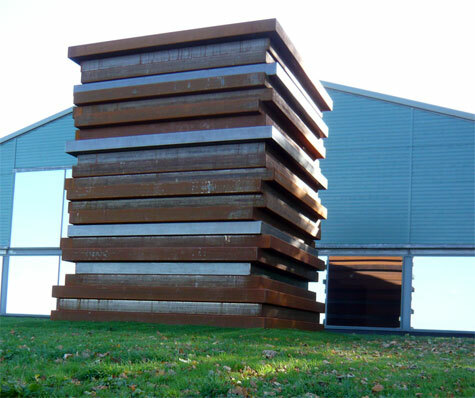 They were looking at a large sculpture of rusty metal framework about the size and shape of a HGV. The interlocking, square-sectioned steel beams resembled the skeleton of a high-rise building before any floors or walls are attached, except in the sculpture, none of the beams made any engineering sense. It was more like a giant puzzle. Bill considered the piece. Finally he said, ‘Well, it must be art because it’s definitely useless.’ All that Mitch could do was mutter, ‘oh dear, oh dear’ over and over again. As they walked back to the gift shop Mitch told Bill about a strange incident he witnessed the previous summer in the park. ‘I was walking by the lake at the other end and there was a young chap protesting. Here’s the funny thing though, he was dressed all in black with a polo neck jumper, black beret and dark glasses. He looked like a typical French avant-garde artist from the sixties. He had a placard that said “THIS IS NOT ART” and he had a scarlet rope pegged up to run completely around himself so the public knew they weren’t allowed to interact with him – except he interacted with them by shouting philosophical questions at them. I’ve never seen so many park wardens in one place with all their walki-talkies crackling at the same time. Judging by their unease I guessed it was some kind of unofficial stunt – probably by a performance art student. It was a good joke though and it got me thinking: I’m not the only one who thinks contemporary art has become a parody of itself. Eventually they reached the main building and on a counter Mitch found a white leaflet printed on matt cartridge paper with lots of blank sections. Inside the gift shop he found some pencils for sale and borrowed one to write his idea down for the story. As he scribbled, his thoughts seemed to tumble in on themselves and, as if in a hall of mirrors, they reflected back into infinity. He thought about the graphite in the pencil: he knew from history that at one time, it was only available from two places in the world, one of which was in England. Then he thought about the wood encasing the pencil – wood that came from a living tree that has been sculpted into a hollow case to hold the graphite. He marvelled at the thought that some people might buy the pencil and then sketch trees with it on paper that was produced from dead trees. How ironic and perfect would that be, how useless an activity? This entry was posted on Tuesday, October 23rd, 2018 at 8:44 am	and is filed under Ideas, short story. You can follow any responses to this entry through the RSS 2.0 feed. You can leave a response, or trackback from your own site. Hallo, ich denke, dass iich sah, die Sie besucht mein website somit i kam ich “revanchieren”. ist ok, um einigye verwenden Ihre Ideen ! !